Just bought an XR and the rear brake pedal seems a little small and have slipped off it a couple of times when applying it, has anybody else had this problem and whats the cure? Spooch - I've never experienced this problem, however, 95% of the time I use the front brake/ linked system only. I only use the rear brake when coming to a stop and no than 15 MPH +/- . If your foot is slipping off the brake pedal, it "could/ might be" the soles of your riding boots? Was slightly smaller than my old bike but i soon adapted and has never been a problem. That's the first thing I noticed. I was having to turn my size 12 inward to reach the small pedal. The Wunderlich pedal solves the problem. Cheers Chicken Strip, part ordered, nice to have a second opinion with an aftermarket item. I have one of those as well - makes rear braking a lot easier and more comfortable. I personally hardly touch it, I know its there, for as and when - but my size 4 feet mean I have to move my foot forward and flap it about to find it.. 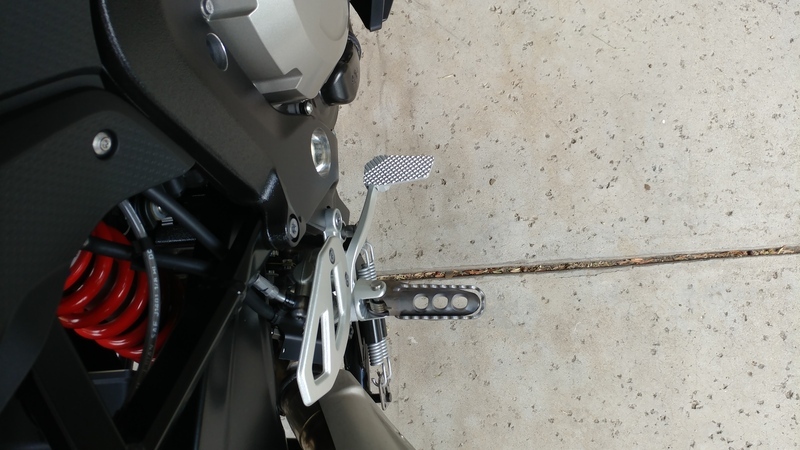 The rear brake pedal on Ducati Monkey strangler is about the same size, difference being when you apply pressure to the XR's there is an arrest in forward movement. Part arrived and fitted and made a huge difference, no more moving my foot to find it and no more slipping off it when I finally do use it. Money well spent.